These movements have shaft dimensions: Hour pipe 5.0mm, Min pipe 2.8x 4.0mm and have similar measurements to the German produced euroshaft movements available today. 17mm shaft high torque eyeshaft clock movement. 20mm shaft high torque eyeshaft clock movement. 23mm shaft high torque eyeshaft clock movement. 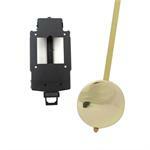 31mm Extra Long shaft high torque eyeshaft clock movement.